CELEBRATING Catholic Schools Week 2019 in Your School PRIMARY Catholic Schools Week 2019 will run from 27th January to 3rd February 2019. 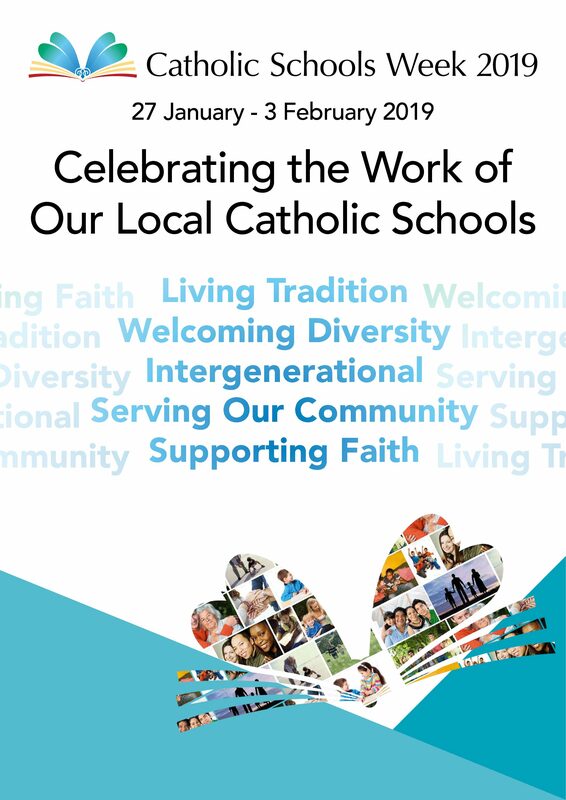 The theme for Catholic Schools Week this year is Catholic Schools: Celebrating the Work of Our Local Catholic Schools. As Irish society changes, it is important that we reflect on the unique contribution of Catholic schools to our collective goal of education. Each Catholic school shares an ethos that is inclusive, welcoming and vibrant. Each school works towards a vision of each student as made in the likeness and image of God (imago Dei). This means that we work towards helping each child, irrespective of background, ethnicity or creed, reach their full potential academically, spiritually and socially. To be in the likeness and image of God means that we have the capacity to truly care for ourselves, each other and the environment around us. While each Catholic school shares this profound commitment to this vision, every school does this differently. Each school is influenced by the community it serves; be it large urban schools, small rural schools, schools with a wide variety of ethnicities and every school in between. For this reason, every Catholic school works in a unique and distinctive manner in educating each child to holistically develop their talent, skills and potential. On Wednesday we celebrate Grandparents’ Day. On that day we offer some suggestions for class activities. A prayer service, for use in the school or classroom, is also available, as well as suggestions for parish celebrations.